On March 21, 1960, at least 180, and as many as 300, black Africans were injured and 69 killed, while protesting in the township of Sharpeville, South Africa, against laws requiring all black citizens to carry passes to be checked at points throughout South Africa, giving authorities statistics about the carrier and where they were from, set to begin in April. The pass law was considered just another step toward complete segregation of blacks and whites, and limiting the rights of the blacks, by the South African government. The African National Congress (ANC) was a group working within the law, against all forms of discrimination based on race. The Pan Africanist Congress (PAC), founded by Robert Sobukwe in April of 1959, was another, more aggressive, group founded to protest discrimination. The ANC and PAC, competing for supporters, rarely agreed on any topic. The ANC had been planning peaceful demonstrations against the pass laws, to be held in the beginning of April, 1960. The PAC, not to be outdone, planned demonstrations throughout South Africa beginning on March 21. The president of the PAC, gave warning to government officials about the demonstrations to be held, where participants were told to leave their passes at home, to peaceably demonstrate their resistance. 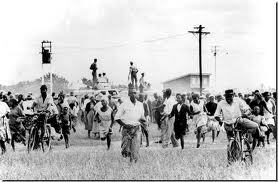 During the demonstration on the 21st, hundreds of black Africans walked to the police station in Sharpeville. During the peaceful march, a commotion broke out near the doors to the station related to protesters being pushed by those behind them. Police Officers panicked and opened fire on the crowd, shooting many protesters in the back as they were trying to flee the scene. This massacre brought the eyes of the World to the behavior of the South African government and is considered the beginning of the anti-apartheid movement.